(CNN) First lady on aisle 4. 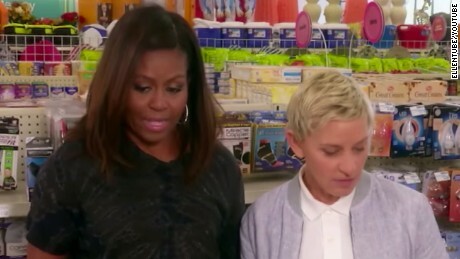 Ellen DeGeneres and Michelle Obama had some fun in a taped segment that aired Wednesday on DeGeneres’s talk show. The pair hit up CVS to grab some items to prep the first lady for life after the White House. Obama appeared set on actually shopping, while DeGeneres played the trip for laughs — teasing customers and insisting on opening a box of wine. “You are not a good person to shop with,” joked Obama, who will vacate the White House when her husband’s term expires in January. That didn’t stop DeGeneres from poking fun at the first lady. She teased her about everything from the latest issue of Essence magazine, which features a photo spread of the first couple, to a more, um, personal matter. “Michelle, what kind of cream do you need for that rash you were telling me about?” DeGeneres asked loudly. Later, Obama fired back. “It’s like taking a 3-year-old to the store,” she said.